The SAFE Bodywork Clinic was held on April 21, 2007. It was presented by Dr Hannah Evergreen of Evergreen Holistic Veterinary. A group of 10 horses and their owners learned about several different holistic healing methods, and also benefited from a bodywork session from Dr Hannah. 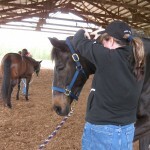 Equine Bodywork Clinic with proceeds benefitting S.A.F.E. Most of us focus on communicating with our horses under saddle, but we forget that communication starts on the ground. Come and learn therapeutic bodywork techniques that help show your horse that you’re listening and trying to help them feel their best. Give your horse a reason to choose you as their herd leader and enjoy a stronger bond based on love and compassion. 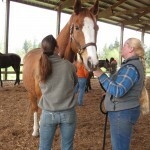 Dr. Hannah Evergreen will be offering a hands on seminar where you can learn more about holistic care for your horse. Acupuncture, chiropractic, massage and more will be discussed and you will learn how to do daily therapeutic stretching and bodywork routines based on the individual needs of your horse. (chiropractic and acupuncture treatments included) Bring your horse and stay all day for the clinic. Clinic format will include a morning hands‐on bodywork session and an afternoon session under saddle, with techniques designed to aid both horse and rider. 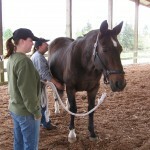 Dr. Hannah also offers therapeutic bodywork sessions for horses as part of her holistic mobile veterinary practice.